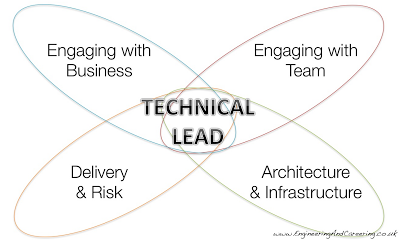 The Well-Rounded Technical Lead is someone who can guide a team through a complex delivery. Being more than an ace technician, she helps the team and the business discover and overcome the challenges, whilst being a barometer for technical risk and a champion for quality. "As a developer, your job is was get stuff done. However, when taking on leading a team, there is an inbuilt assumption that you can't and shouldn't do everything on your own. You are working with a team to scale up what you do, leveraging your skills and experience, to help do what you can't do alone. You'll need to think strategically, set direction, share, and help the group become or stay a team." "Directing the build-out of a software project is fraught with difficulties. There is a definite requirement to build something fit for purpose, often quickly with new or untested technologies. But what 'fit for purpose' means is often changeable or not clear. As a Technical Lead, it's easy to get lost in the deadlines, or to build something that functions but doesn't work when the pressure’s on." "Software projects fail. Sometimes that's good — fast failure is far better than a long drawn out death-march. However many projects fail for disappointing reasons. Problems that could have been prevented if the right information was uncovered and acted upon at the appropriate time." "A mixture of exposure, experience and reflection feeds the growth of a Well-Rounded Technical Lead. A strong, progressively developing definition of the role can be used to widen your skills and strengths. " "There are many insightful views on what makes a great Technical Lead in blogs and articles across the net. Below are some that I feel offer really powerful guidance."